Integrating GPS into your treasure hunts can be one of the best things you can do to improve your chances of success. The biggest hurdle is that a lot of people aren’t “tech savvy” and intimidated by the unknown, but fear no more. Here is a step by step process to help you zero in on those spots that you know are “somewhere in that area”. 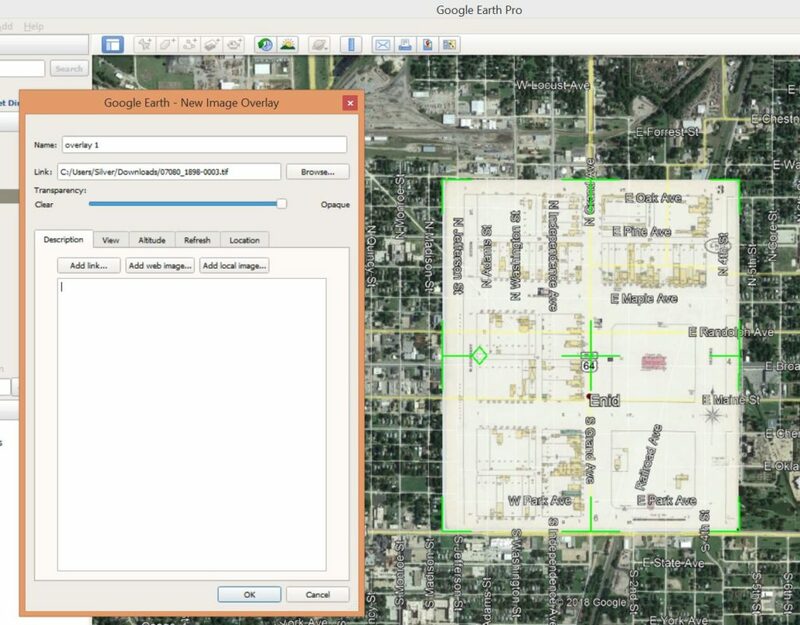 The first step is to download the Google Earth Pro Desktop app from https://www.google.com/earth/ and install it on your computer. This has a lot of powerful features, including high resolution imagery, 3D cityscapes, detailed road maps, panoramic imagery at street level, as well as switching between historical satellite imagery and overlaying digital images. 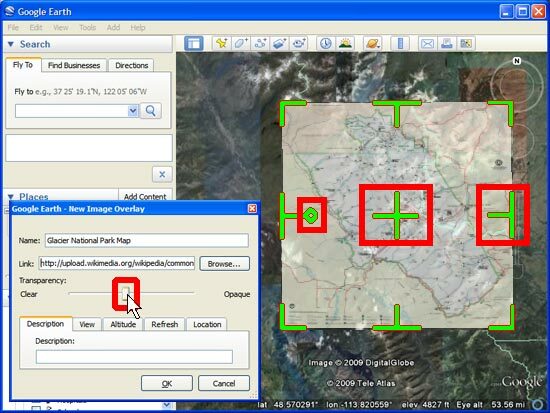 OK, now that you have the mapping program, you need to integrate your aerial pictures or historic maps into it. Make sure that you start with the highest resolution digital images possible. You will really appreciate that fine detail when you zoom in and are still able to read names and labels. 1) Zoom in to the location that you are conducting research on. 2) Click on the “Add Image Overlay” button on the top of the image viewer. 3) Give your image overlay a name, this is what you will see under the “My Places” on left hand side of the app. In this example I named this “Overlay 1”. 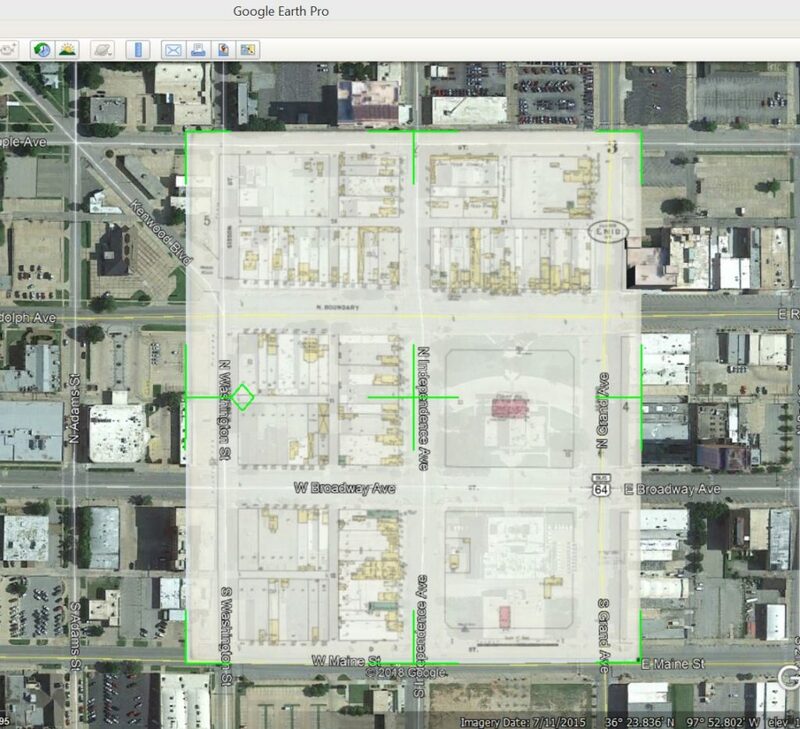 4) “Link:” is where you tell Google Earth where to find the image you want of use. You can use the “browse” button to the right to locate the file in it’s sub-folder. 5) Adjust the transparency. If you are overlaying on an existing town, its usually easier initially, to leave this as completely “opaque” to help you line up streets. 6) Move and adjust the image. Look at the green marks on the overlaid image. These are image adjustment points. Left-clicking and holding one of these green lines or points allows you to move the image around and scale it to size. If you notice my overlay, because I used a large size file, it will initially lay the image over a much larger area than you really want. Click and drag the green corners or sides to bring the image to the correct size. Use the center cross-hairs to click and drag it to the correct position. NOTE: when adjusting size with the corners, it IS NOT a scaled adjustment. You can skew it longer or wider depending on how you use your mouse. Some image programs use corner tabs as a scale up or down while preserving the original ratio. This has led to some confusion for people while using Google Earth. 7) Once you have the rough sizing and location set, use the Overlay window to adjust your transparency. I like to set it about 75% so that I can see the existing ground feature through the overlay. 8) Make your fine adjustments. Tweek the sizing and location until the overlay points (streets, lots, buildings, etc) are as close as possible to those still-existing map points. 9) add any notes you want to remember in the description tab. If you need the overlay image rotated, you can use the green diamond on the side of the image overlay to make large adjustments. If you need some fine adjustment, click on the “Location” tab of the Overlay window. There is a rotation setting that you can manually change by extremely small increments if need. 10) Click “OK” to lock in your overlay. If in the future, you want to adjust the overlay further, find the overlay name under “My Places”, right click the name and chose “options” at the bottom of the pop-up. This will bring up the Overlay window for all adjustments and changes. One thing to keep in mind is that regardless of how detailed and precise the old maps you are using to overlay, do not expect them to match 100%. Getting one block and buildings lined up to existing structures will possibly leave you slightly off on another. Be happy to get 98%. You are still going to be within a few feet of true which is close enough for treasure hunting! If you really want to get as precise as possible, you would need to digitally cut up the map section images and adjust them block by block. City blocks often do not stretch from street edge to edge. Most cities have a public right-of-way and the private property lines lay inside. If sidewalks are visible, the property lines usually sit at the inside edge. If you are anything like me, you are going to be spending a lot of time playing with Google Earth and image overlays. Most towns have many years of old maps available in digital format online. You can have all the overlays visible at once, or one at a time. You can toggle each overlay on and off by clicking the box beside it’s name. 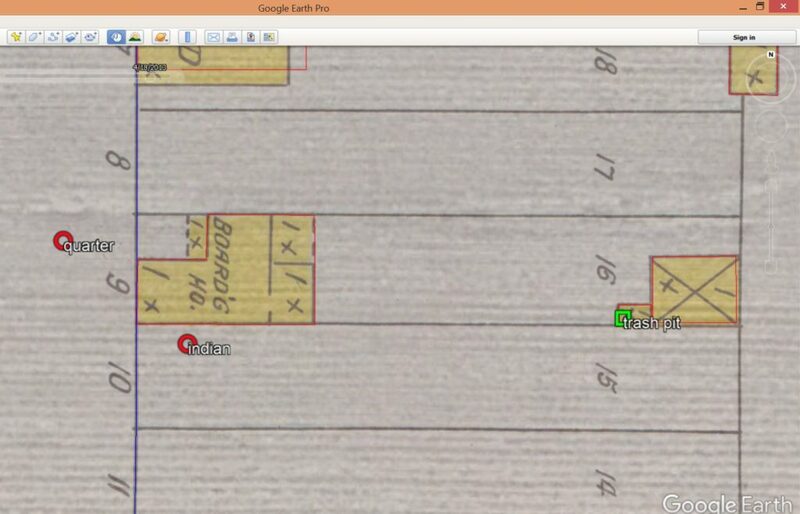 This is valuable when using the historic imagery button at the bottom of the map. This feature is most useful when looking at rural locations. Changes in crops and seasons can highlight features that may help you line up your overlays with more accuracy when you don’t have many (or any) existing structures to use to scale and center your overlays. When you click that button, a slider will open at the top of the map. You can use this to move back and forth to satellite imagery from different years. 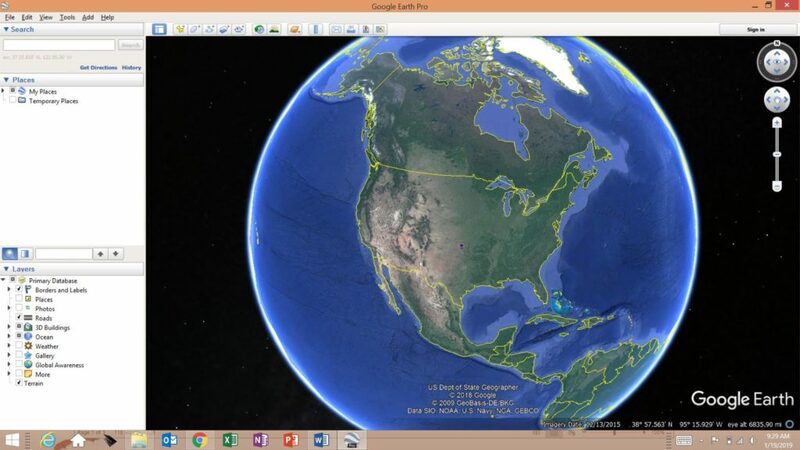 Once you have your historical map or image successfully overlaid, look down at the bottom right corner of Google Earth. Thats where the GPS coordinates are located. Anywhere your pointer is at on the map page, the Coordinates for that exact spot can be found. All you need to do is put those into whatever handheld GPS device (including most cell phones!) you use to allow you to walk to that spot. Photos and maps and GPS, oh my! Historical aerial photos, combined with historical maps can be a amazing combination. Case in point: one of my ghost towns that I have spent a lot of time hunting. No photographs of the town have ever been found. 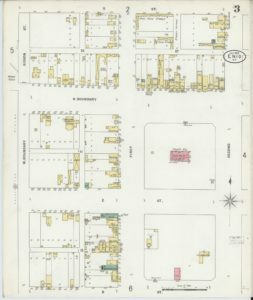 One crude map from Grey’s Atlas and a fire insurance map are all that existed. 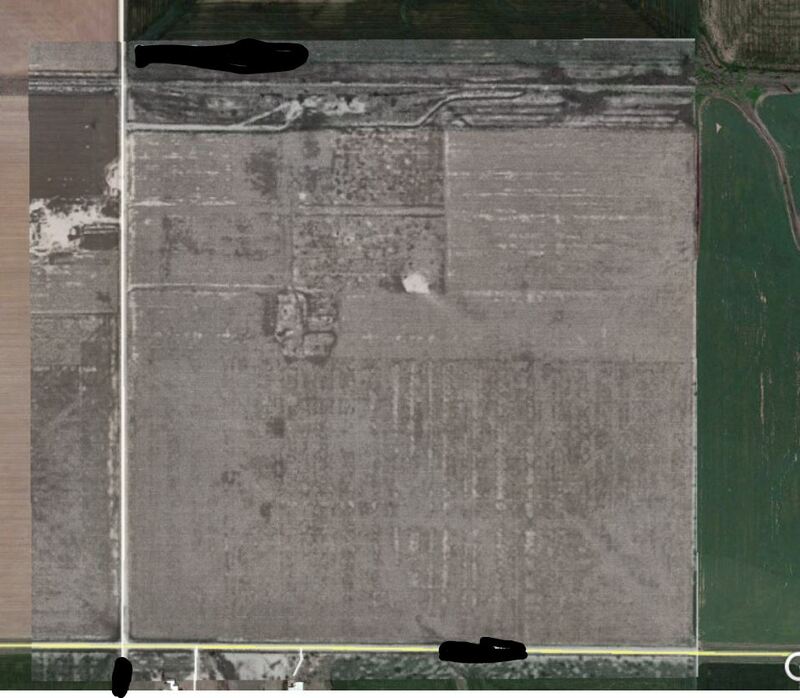 Neither showed EXACTLY where in the farm field the town sat. After a lot of playing and adjusting, I felt I was fairly close, but I was never certain. 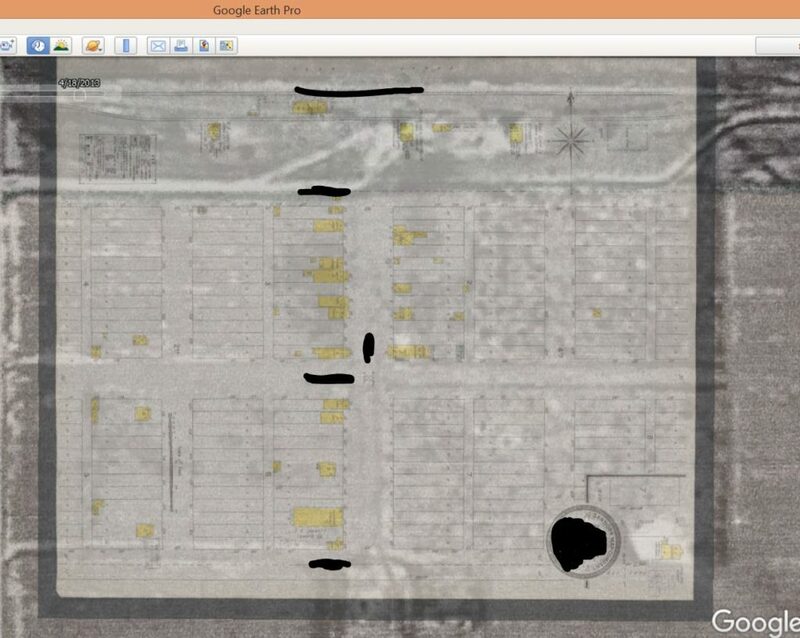 Then, I located a 1930 aerial image of the same spot. All the town buildings were already long gone, but the ghosts of the main streets and the town boundary were still visible. The best part was that the image had the entire section of land with county roads and field boundaries. This let me easily set the 1930 picture to the exact points that still exist today. Then I could adjust the fire map to match the roads and nearby structures in the picture. And there I had it! Now I had the town buildings exactly in place and I can pull GPS coordinates for any feature I wanted. Then its a simple matter walk to that spot in the middle of a farm field to begin hunting. Ghost town privy, exactly where GPS said it would be.